Trailer for the explosive new political documentary Uncounted. This controversial film by Emmy award-winning director David Earnhardt shows how the election fraud that changed the outcome of the 2004 election led to even greater fraud in 2006 -- and now looms as an unbridled threat to the outcome of the 2008 election. Jenkintown Showing at Hiway Theater April 16. With election fever mounting for the Pennsylvania primary, the Election Reform Network is proud to be hosting the Philadelphia area theatrical premier screening of. Uncounted: The New Math of American Elections Wednesday, April 16 at 7 p.m. at the Hiway Theatre in the center of Jenkintown on Old York Road. Tickets are $8 and will be available at the door. RSVP to to the Election Reform Network. Join Emmy award-winning filmmaker David Earnhardt for a lively and strategic conversation afterward about what we can learn from the recent American elections. Find out what steps we in the greater Philadelphia area can take now to protect the vote in 2008 and beyond. Emmy award-winning director David Earnhardt. Uncounted is an explosive new documentary that shows in graphic detail the vulnerability of American elections and the inspiring stories of true heroes working in the trenches of democracy to protect the vote. It is a stunning wakeup call -- making clear that this year it is not enough merely to vote. Uncounted shows well documented stories about the callous disregard for the right to vote. 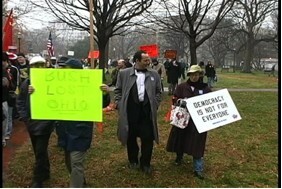 Voting rights protest November 2004 in Ohio. Watch Florida computer programmer Clint Curtis, who describe how his boss directed him in 2004 to create software that will "flip" votes from one candidate to another. See the startling story of County Clerk Bruce Funk -- locked out of his office for raising questions about security flaws in electronic vote machines. Protest as Californian Steve Heller gets convicted of a felony after he leaks secret documents illegal activities committed by a major voting machine company. Mourn as Tennessee entrepreneur Athan Gibbs attempts to sell verifiable voting machines, but dies before his dreams of honest elections can be realized. In Pennsylvania, a key battleground state in the Presidential election, 54 of 67 counties vote on paperless electronic vote machines, which are unauditable and unrecountable. Common Cause considers our state to be at "high risk" for compromised elections. Yet there are those who say raising questions about the integrity of the vote and the formidable barriers to participation faced by many groups – despite mountains of evidence that the problems are real - discourages people and therefore undermines what we care most about. Better to pretend that there are no problems and urge people to vote and hope for the best, they say. This is America. Count every vote. The Election Reform Network and the election integrity movement nationwide urge people to vote, and we will continue to do so -- but not with their eyes closed! Democracy doesn’t work very well when citizenship feels like sleepwalking. In fact, democracy is by definition an active process, something that we as citizens have to protect, nurture, even rediscover and reinvent periodically, or it starts to creak and crumble. This is one of those times. You won’t be discouraged; you’ll be informed -- and energized for action. The film will be shown at the Hiway Theater, a beautifully restored community facility originally built in 1913, at 212 Old York Road in Jenkintown. Businesses, nonprofit organizations and individuals are invited to cosponsor this event. The Election Reform Network aims to generate a sizable audience interested in learning more and becoming involved in safeguarding our elections and expanding openness, transparency and ethics in government. Since the modest $8 ticket price will likely not cover all expenses, they are seeking out those interested in supporting this work through contributions of $100 (designated “Leaders”) and $50 (designated “Advocates”). Cosponsors will be invited to join Emmy Award-winning filmmaker David Earnhardt for a light meal prior to the event. In addition, the names of all cosponsors will be highlighted in the program to be distributed to attendees. 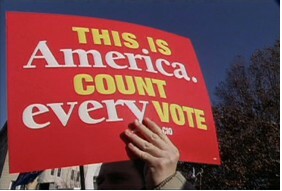 Contact the Election Reform Network to help with this effort.